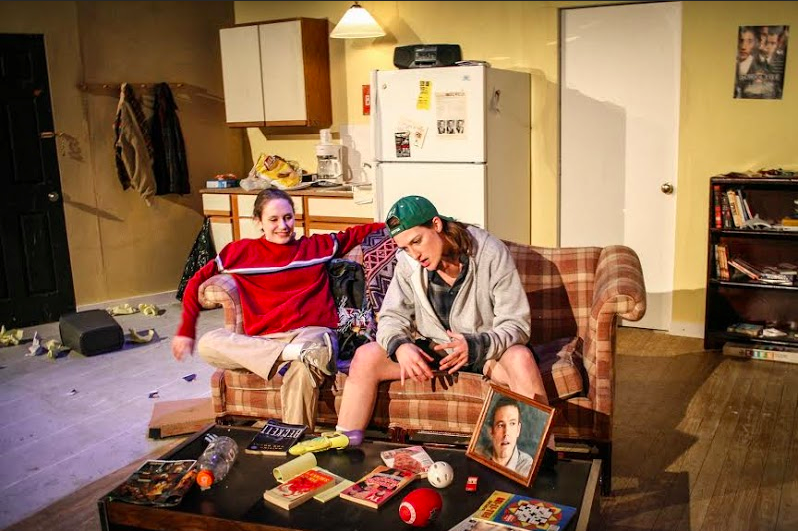 Left to Right: Nora Bingham and Kate Healy in First Floor Theater’s “Matt & Ben,” written by Mindy Kaling and Brenda Withers, and directed by Amanda Fink. Courtesy of First Floor Theater. The play, co-written by “The Office” and “The Mindy Project” actress Mindy Kaling, follows Affleck and Damon as they attempt to write a script based on the novel “Catcher in the Rye” and become famous actors. In the midst of their process, a script, which turns out to be Oscar-winning film “Good Will Hunting,” falls from the ceiling and absurdity ensues. What sets this play apart is that female actors play the male characters of Matt and Ben. Nora Bingham, marketing director of First Floor Theatre and University of Chicago graduate, played Matt while Kate Healy, a Chicago-based performer and playwright, played Ben. While this was a seemingly interesting concept, it played out more like a gimmick featuring stereotypical, gender-driven jokes instead of a unique and humorous alternative perspective. The non-traditional set was located in a tiny, windowless room as opposed to a curtains drawn, center stage, broadway production setup. A minimalistic but messy interior design of a couch, desk area and kitchen managed to accurately represent the inhabiting characters. A television sat to the right of the stage, which played short programs during scene transitions. The show was complemented by a typical 1990s soundtrack, featuring Biggie Smalls, No Doubt and Nirvana. A downside to the set’s authenticity was that the characters couldn’t keep their hands off the potato chip bags and pizza boxes adorning the pigsty pad. Distracting food chewing interfered with the cast’s annunciation, and several lines went over the audience’s heads. The play benefited from strong and believable acting by Bingham and Healy. Some of the most memorable moments of the production were Healy’s rendition of Minnie Driver’s last lines in “Good Will Hunting,” and Bingham changing characters to make a reincarnated J.D. Salinger cameo. Despite the acceptable performances, the actors couldn’t do anything with the dialogue as the show’s main problem was the script. It was riddled with cliché jokes that one wouldn’t expect from an Emmy-nominated writer. Ben is portrayed as a dumb and lazy neo-frat boy, while Matt is a smart and hard working, yet, struggling actor. These are perhaps unfair depictions of them, as there is not really evidence either personality is accurate. Even the authentic footage of Affleck and Damon’s infamously over-the-top Oscar acceptance speech played at the end of the performance was not as melodramatically goofy as the performers’ interpretation. The funny and promising premise turned into a predictable, familiar, high school drama class production. Kaling, although undoubtedly a talented actress and television writer, clearly needs some work before calling herself a playwright.